Vences-Catalán, F., Srivastava, M. K. and Levy, S. (2016). Macrophage Polarization by Tumor-induced MDSCs Assay. Bio-protocol 6(16): e1900. DOI: 10.21769/BioProtoc.1900. Myeloid derived suppressor cells (MDSCs) are a subset of granulocytes (immature myeloid cells) that exploit a variety of mechanism to modulate the innate and adaptive immune system. MDSCs are present normally in the body, but their numbers increase during inflammation and in cancer, promoting an immunosuppressive microenvironment. In addition to MDSCs, macrophages also play an important role during cancer development. There are two subsets of tumor associated macrophages (TAMs): M1 and M2. M1 are “anti-tumor” macrophages that are activated by interferon gamma (IFN-γ) and/or Lipopolysaccharide (LPS) and secrete high amount of interleukin 12 (IL-12) thereby inducing a Th1 anti-tumor immune response. M2 or “pro-tumorigenic” macrophages are activated by interleukin 4 (IL-4) and interleukin 10 (IL-10) and secrete large amounts of IL-10, which promotes tumor progression (Gabrilovich et al., 2012). Interaction between MDSCs and macrophages in the tumor microenvironment was shown to enhance immune suppression mediated by these subsets. MDSCs influence TAMs by producing IL-10 that, in turn, induces a down-regulation of IL-12 and polarizes M1 into M2 macrophages. In our study, we use the following protocol to evaluate the ability of tumor induced MDSCs to polarize LPS activated M1 into M2 macrophages (Vences-Catalan et al., 2015). This protocol was adapted from a previous study (Sinha et al., 2007). Note: We use 6-8 weeks old female Balb/c mice, but any strain of mice can be used as long as both macrophages and MDSCs are from the same genetic background. Note: We use 4T1 breast cancer cell line syngeneic to Balb/c; this tumor model is known to induce a strong accumulation of MDSCs in blood, spleen and tumor. Note: A 3% solution in water and sterilized in autoclave at 121 °C for 15 min has been used. Note: 5 ml of this solution was used in 500 ml of RPMI 1640 media. Note: If using a different tumor model where MDSCs in blood or spleen represents a small percentage of total Peripheral Blood Mononuclear Cells or splenocytes, respectively, purify MDSCs with myeloid-derived suppressor cell isolation kit and follow instructions according to manufacturers protocol (Miltenyi Biotec, catalog number: 130-094-538 ). Note: Isolation of peritoneal macrophages as well as MDSCs should be performed under sterile conditions. Inject intraperitoneally (i.p.) 3-4 naïve Balb/c mice with 1 ml of sterile 3% thioglycolate 4-5 days before macrophage isolation. 4-5 days later, euthanize mice by cervical dislocation (AVMA Guidelines for the Euthanasia of Animals: 2013 Edition). Carefully make a small incision on the skin to expose the peritoneal wall, avoid cutting the peritoneal wall to prevent leakage of the PBS. Harvest peritoneal cells by injection of 5-10 ml of sterile cold PBS into the peritoneal cavity; give a small massage to shed the peritoneal cells (use 18 gauze needle for the extraction, wash several times with PBS). Collect PBS each time you wash the peritoneum (Lu, 2013). Spin the cells at 300 x g for 5 min, count the cells and resuspend in RPMI or DMEM media containing 10% FCS and 1% Pen-Strep. If red blood cells are present, lyse with ACK buffer. Briefly, add 3-5 ml of ACK lysis buffer and incubate for 5 min. Quench the reaction by adding two times the volume of PBS. Spin for 5 min, 300 x g and repeat wash one more time. Plate cells at 7.5 x 105 cells/well/500 μl of RPMI or DMEM/10% FCS and 1% Pen-Strep in 24-well plates, and incubate at 37 °C in 5% CO2 for 3 h.
Remove non-adherent cells, and wash the attached cells once with RPMI or DMEM media. Save an aliquot (to detach the cells add 2 mM EDTA in PBS for approximately 10-15 min, collect the cells and spin down for 5 min at 300 x g), resuspend in PBS and evaluate the purity of your macrophage population by staining with CD11b and F4/80 antibodies (1 μg of antibody per million of cells) by flow cytometry, as illustrated in Figure 1. Inject 1 x 104-1 x 105 4T1 cells subcutaneously into the mammary fat pad of female Balb/c mice (Reuter, 2011). On day 21-28 almost 90% of white blood cells are MDSCs (doubled positive CD11b+Gr1+), as seen in Figure 2. 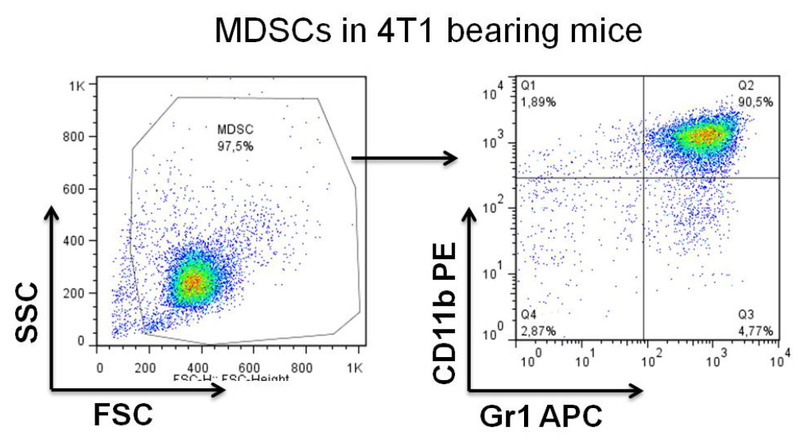 Determine the percentage of Gr1 positive MDSCs by staining with anti Gr-1- APC and CD11b- PE antibodies and analyze by flow cytometry (1 μg of antibody per million of cells). On day 21-28 after tumor implantation, collect 100-500 μl blood by cardiac puncture from tumor bearing animals and lyse red blood cells with ACK buffer for 3-5 min at RT (5 ml of ACK for 500 μl of blood). Wash cells twice with PBS by spinning two times at 300 x g for 5 min at RT, count cells and resuspend in complete media. Optional: If MDSCs represent a minor percentage of total white blood cells, purify MDSCs with myeloid-derived suppressor cell isolation kit. 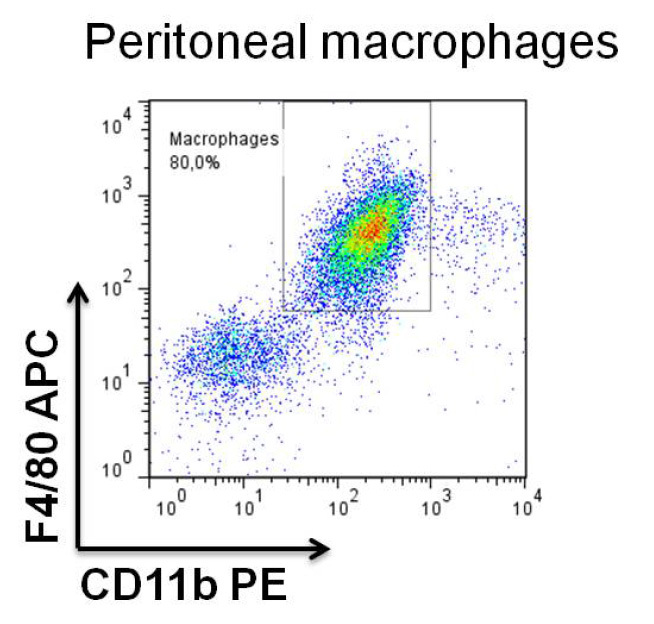 Co-culture MDSCs (1.5 x 106 MDSCs/well/500 μl of RPMI or DMEM/10% FCS and 1% Pen-Strep media) with 7.5 x 105 macrophages by mixing them together in the same well (or at with different ratios MDSCs:Macrophages, 2:1, 1:1, etc.) in triplicates, add 100 ng/ml of LPS and incubate for 16-18 h at 37 °C, 5% CO2. 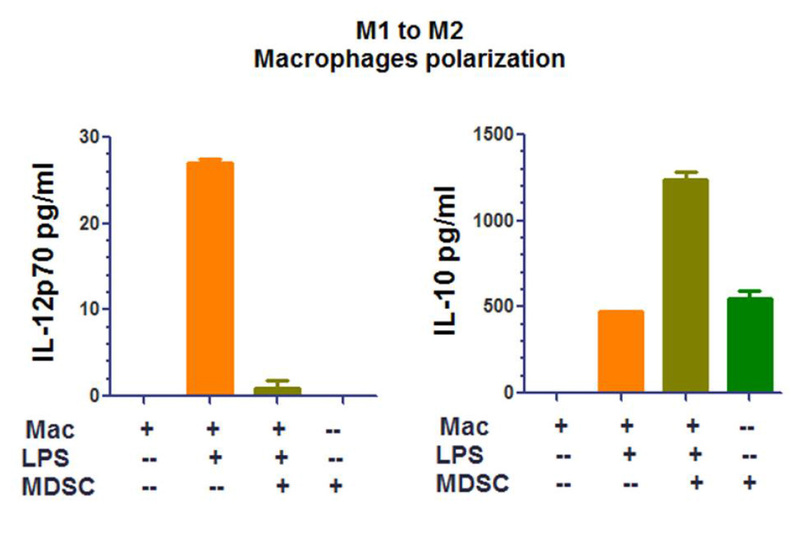 Include wells that contain only macrophages and only MDSCs as controls (as represented in Figure 3) as well as in the presence and absence of LPS, as illustrated in Figure 4. After 16-18 h, collect culture supernatants and measure IL-12 and IL-10 secretion by ELISA (Remove cell debris by spinning 3 min 800 x g). Optional is detection of IFN-γ secretion according to the manufacturer’s protocol. This work was supported by the Translational Cancer Award from Stanford Cancer Institute and the Breast Cancer Research program from the Department of Defense grant W81XWH-14-1-0397. This protocol was adapted from a previous study (Sinha et al., 2007). Gabrilovich, D. I., Ostrand, R. S. and Bronte, V. (2012). Coordinated regulation of myeloid cells by tumours. Nat Rev Immunol 12(4): 253-268. Lu, M. and Varley, A. W. (2013). Harvest and culture of mouse peritoneal macrophages. Bio-protocol 3(22): e976. Reuter, J. (2011). Subcutaneous injection of tumor cells. Bio-protocol Bio101: e166. Sinha, P., Clements, V. K., Bunt, S. K., Albelda, S. M. and Ostrand-Rosenberg, S. (2007). Cross-talk between myeloid-derived suppressor cells and macrophages subverts tumor immunity toward a type 2 response. 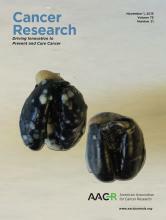 Journal of Immunology 179(2): 977-983. How to cite: Vences-Catalán, F., Srivastava, M. K. and Levy, S. (2016). Macrophage Polarization by Tumor-induced MDSCs Assay. Bio-protocol 6(16): e1900. DOI: 10.21769/BioProtoc.1900.